Viola will reign on stage this evening. Languorous, eloquent, noble, velvet, sensual and powerful: this is how you can describe the timbre of this string instrument. Viola is a ‘philosophical’ instrument. Many renowned composers used the distinctive sound of viola in an ingenious manner. One of the best viola players of our time is Yuri Bashmet. This talented musician has played almost the entire repertoire, written for viola, which includes about 200 pieces, 40 of them contemporary composers created for and dedicated to Bashmet. 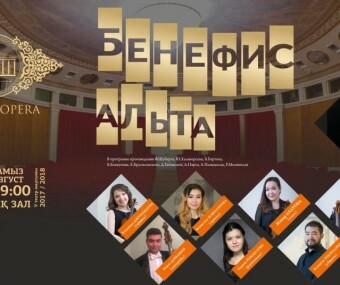 The concert will feature Pavel Romanenko, who graduated from the Kazakh National Academy of Music and completed his post-graduate studies with honours at the Moscow State Tchaikovsky Conservatory under the guidance of People’s Artist of the USSR, Professor Yuri Bashmet. Pavel Romanenko and other Kazakhstani musicians will perform works by composers of different eras – from Baroque to the 21st century music. The programme will include works by Schubert, Halvorsen, Bartók, Bayakhunov, Brusilovsky, Tabakova, Pärt, Piazzolla and Molinelli.